I forgot today was St. Patrick’s Day. How?…I have no idea. I’ve been blogging about it for about a week now. We are in Marco Island for my husband’s work function so this morning the kids were eating breakfast before heading to morning Beach Camp with their friends and I realized they weren’t wearing any green. I just imagined them getting pinched and teased all day because of my forgetfullness. Lucky for me, in the middle of the breakfast table there were St. Patrick’s Day stickers and necklaces. 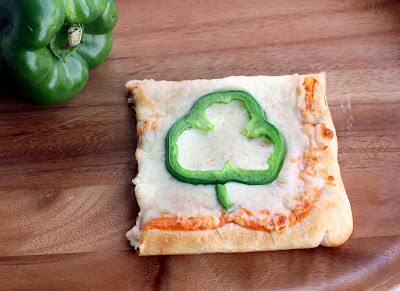 So even though I was a crappy mom today, I at least remembered earlier this week and made these cute Shamrock Pizza Squares. It’s a basic pizza but I added cream cheese and seasonings to the pizza sauce because I believe cream cheese makes all things better. 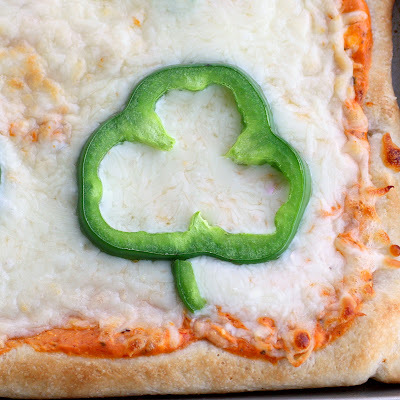 Green bell peppers make the perfect shamrocks. An easy fun treat for St. Patty’s Day! The weather is gorgeous right now in Florida. This time of year is what sends snowbirds flocking to us. Although my little Brocky still tells me that he’s freezing (it’s 80 degrees). I must be lucky because this is what we woke up to this morning. So now we are off to play in the ocean with the boys and get sand in places where the sun doesn’t shine. Being able to download custom content is one thing that its not all gamers are very worried about. can make it relatively easy to produce custom PC applications with all the technology. Likewise, you can find widescreen format gaming laptops high are laptops that have a regular aspect ratio — like that of an TV. disable them before they are allowed to play. I agree, that cream cheese does make everything better! 🙂 I am going to try adding it to my pizza. Thanks! Nice! great place to chill! I bought a box of 8 little tubs at Michaels in the decorating section. I’m not home but I think they just say icing gel coloring! I will check when I get home tomorrow. just a question about the double rainbow pancakes (so awesome by the way). did you buy the wilton gels individually, or is it that box with 8 or 12 colors, that has the little tubs (says its for icing coloring)? ahaha I love this! Your little pizza squares are the cutest! Cute and funny, love it. Cream cheese does make everything better. And there is no way you are a crappy mom when your kids are at BEACH CAMP in March. Sounds like amazing parents to me. I would love to be your kid. 😉 Plus you make things like shamrock pizza for them. oh em gee! how stinkin cute! i made your healthy three cheese pasta bake lastnight and it was soooo good. i just ate some leftovers for lunch. and i mentioned it in today’s post on my blog about it being delicious. so thanks! I’m so jealous of that beach right now. I just happen to have a bell pepper, so I’m making that pizza for the kiddos. Thanks for the great idea. oh I love it. You are not a bad mom you forgot. I did to until I was pouring milk in their cereal and a little food coloring and bam the leprechauns came and I am so cool. My kids are easily pleased… That water looks so nice. I so wish I was there today. Have fun in your “freezing” temperature!